PRECISE, ACCURATE, REPEATABLE THERMAL PERFORMANCE, NO MATTER WHICH CONFIGURATION YOU CHOOSE. 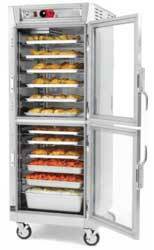 Metro® C5™ 8 Series Controlled Temperature Heated Holding Cabinets are designed to precisely maintain food temperature. Intelligent temperature control takes the guesswork out of holding your food product. Simply set the desired cabinet temperature and the proprietary 8 Series controller does the rest by continuously monitoring, displaying, and maintaining the internal temperature of the cabinet. Precise control gives professional results. Lip-load slides for sheet pans. Removable water pan for passive humidity generation. Double pane, insulated, tempered glass doors. Built-to-last door latches and lift-off hinges.